Hey all, today we have blog hop to say goodbye to DT member Sarah G.
Sarah is a talented lady, and her CAS style is pretty well known! I am sure we will see Sarah G around the blogland. We will miss your creations at Uniko Sarah! I have used the Happy Succulents set here. I used chalk inks to stamp the stamps and colored the succulent with a light purple shade marker. The sentiment is from Simply said Birthday. The flowers looks so gorgeous. Your card is absolutely gorgeous Rahmat ! 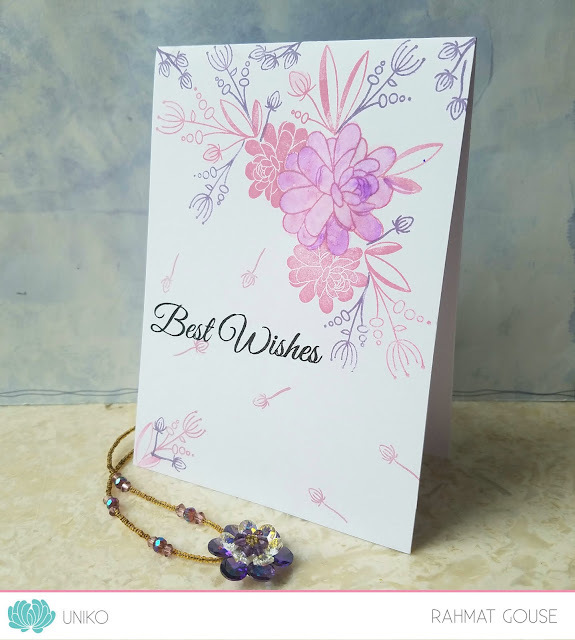 Love the soft colours you used, they make the card so delicate and feminine! Love the little flowers you stamped here and there as if they were blown by the wind ! Thanks for the great inspiration! A sad farewell to Sarah, who has been an outstanding ambassador and source of amazing inspiration for Uniko. Her creativity here will be deeply missed; hopefully, we’ll still see her crafting, as such talent ‘needs’ expression. Your succulents are lovely, especially paired with the heart-warming sentiment.